Wash and cut broccoli into small pieces and set aside. Combine all sauce ingredients into a bowl. Combine sesame oil and Guar gum in a small bowl or glass. 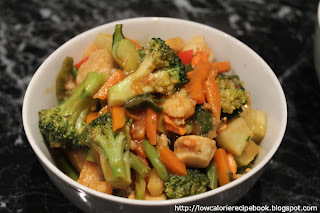 Heat no-stick wok or fry-pan and add broccoli and frozen vegetables, frying until thawed. Add scallops and sauce and stir until cooked. Lastly add oil mixture and stir though until the juice thickens. Divided mixture into 3 potions and serve.